The wrecked car remained on the vacant lot at Second and Chicago Street on Dec. 4. It seems to be hard to keep Albany free of junk and trash, especially stuff like this wrecked car, which has been sitting on a vacant lot at 215 Chicago St. S.E. The trouble here is that the vacant lot belongs to the BNSF railroad company, which has leased its tracks in the vicinity to the Portland & Western. In fact the car bears a paper note — torn and barely readable after being out in the weather — from someone at P&W giving notice that he’ll have the wreck towed away in 72 hours. That was, if I correctly deciphered the date, on Oct. 26, and obviously the tow had not happened when I went by there again on Dec. 4. But here’s the thing. Railroads across the country own lots of land along their tracks that is mostly unfenced and untended. If they were quick to cart away anything that people left on their property — from household trash to old mattresses and wrecked cars — they wouldn’t have time to run their railroads. They’d be running a trash pick-up and disposal service instead and probably go broke in the process. Citing the railroad wouldn’t make any sense. The P&W didn’t dump that old Nissan there. Why should they have to answer for it in court? The railroads are in the same position as governments and agencies that own lots of unprotected public lands. The federal land agencies, for example, mainly the Forest Service and the BLM, for years have had to cope with the ugly results of people using our public lands as dumps. 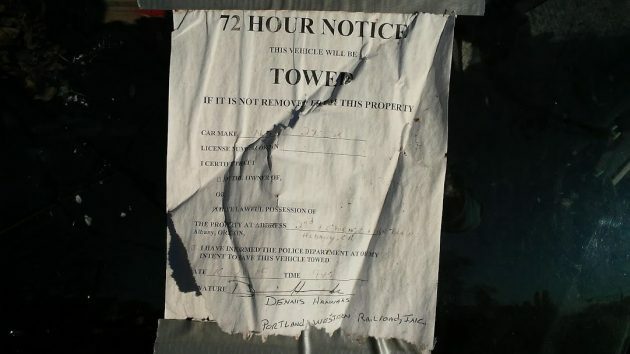 Towed in 72 hours? Would be nice if that was a possibility. If any vehicle still has plates on it, send a hefty citation to the last known owner with a notice that it will be towed. 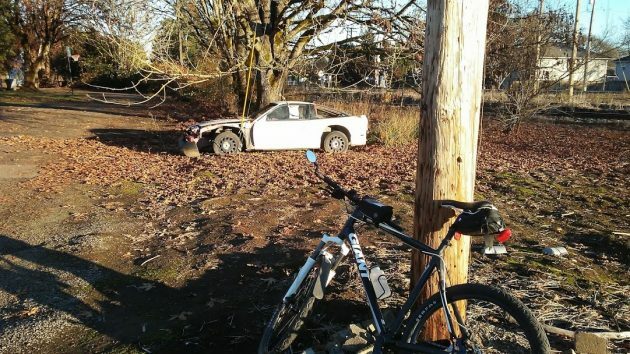 If they don’t reply and/or take care of the abandoned vehicle, then suspend their license. The fact is that, as humans, we are motivated by money and convenience. IF you hit them in their pocketbook and take away their driving privileges, then maybe folks would be a little more responsible. Driving is a privilege. Doesn’t even need to be any plates. Just run the VIN. Cops could do it in a few minutes if it mattered that much to the city. Property could easily be seized as abandoned and given to an auto wrecking yard who might be able to make enough in recycling and salvage of parts to pay for towing it to their yard. Maybe after a certain time the vehicles could deemed abandoned and allowed to be removed for scrap metal. Republic Disposal is raising rates in Jan. $85 minimum and still closed on Sunday. This used to be a public service with affordable rates and hours that allowed residents weekend access helping our community to stay clean. This problem is going to be worse soon! One of the problems is “Who has the title? ?” Car wrecking places & even Burchams Metals won’t take a car w/o a title. If they did it would have to be held for x-number of days, then hold an auction, then get a sheriff’s title. Long, trouble some process. Now IF by somehow the car was found smack dap in the middle of the street the City could tow it immediately as a hazard. Maybe a group of concerned citizens working under cover of night were to tow it out….problem solved. Ummm – Tow it where? The answer? Would people looking for scrap metal be allowed to haul it away? would any scrap yards be interested? Free for the taking? I would gladly take a pregnant cat. A junk car? No thanks. Have to confess to fostering a pregnant cat or two. Thanks for the great idea. Now with Coffin Butte Landfill raising their minimum rates almost 50% starting January 1st I will now have an alternative dump site (joking) but a lot of other people won’t be joking. As hard as I try, I just cannot drum up any sympathy for the railroads. I own a house on a lot here in Albany. If somebody comes along and dumps a couch or fridge or anything else (even an old car), then the authorities are gonna hold me responsible for dealing with it. If that rule is good enough for me, why isn’t it good enough for the railroads? ?